I’ve lived in Arizona for over 50 years, and for most of that time Oak Creek Canyon has been my haven. I rode down the switchbacks in my girlfriend’s boyfriend’s ’57 Thunderbird, when it was brand new and we were, too. I had my Senior High ditch day at Slide Rock. I swam naked in the creek with one boyfriend and was proposed to by another, sunbathing on the red rocks near the creek. Oak Creek fed my soul. When my first marriage was disintegrating I’d come down to the creek and stick my feet in the water and just cry until my toes were numb, and then dry my eyes and my feet and pick up the pieces of a challenging life. This pristine beauty has been a sanctuary and an anchor for me, and I thought it would be always be there. Now it is not. 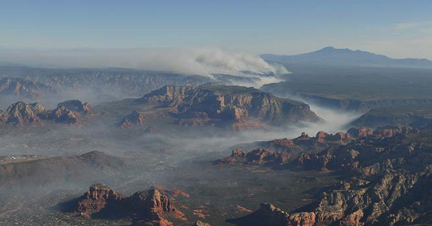 In just 24 hours, with 40 mile per hour winds and 10% humidity, the fire started north of Slide Rock and raced through the entire canyon. What had been a lush, green oasis in the desert, visited by something like 4 million people a year, is now a blackened crater. I should be grateful. Thus far no structures have been damaged or people hurt. Part of the canyon, the lower part, they say is still at present intact, untouched by the fire. Yet I mourn what has passed from my life and never will return. For it has passed, and this will never be OK. 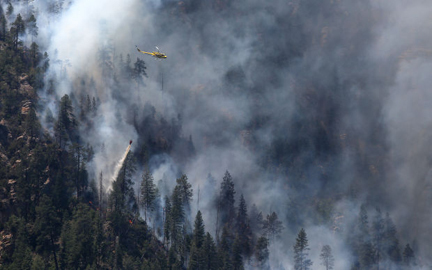 This entry was posted in loss, nature and tagged Arizona, Arizona Daily Sun, fire, grief, loss, Oak Creek Canyon, Slide Fire, Slide Rock State Park, smoke by Lakota Grace. Bookmark the permalink.